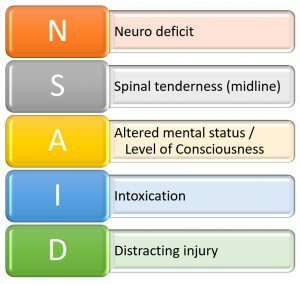 In this inaugural episode of the Medical Director Minute Podcast, we examine selective spinal immobilization / spinal motion restriction (SMR) guidelines to examine the literature behind most of these protocols. In recent years, there has been a movement to limit use of long spine boards, a former staple of EMS. While the use of spine boards for immobilization (aka, spinal motion restriction or SMR), there are some valid uses for spine boards as you can see in this youtube video (no, that’s not me in the video…). The two sets of guidelines most of these protocols are based on are the National Emergency X-ray Utilization Study (NEXUS) and the Canadian C-Spine Rule. Both of these rules have the pros and cons and have been prospectively validated. As with everything, there are pros and cons…. 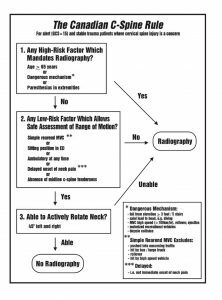 Remember, while these decision rules are helpful in determining who within a large group reqired SMR, we still need to apply these decision guidelines to our specific patients. This will be the subject of part 2 of this two part series.